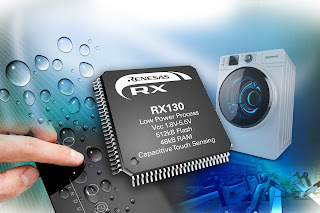 Renesas has launched 38 new microcontrollers (MCUs) in its RX130 Group with flash memory extended to 256 KB, 384 KB and 512 KB. Increasing the package size up to 100-pins provides higher performance and compatibility with the RX231/RX230 Group of touch MCUs. The low power, low-cost RX130 Group adds higher responsiveness and functionality for touch-based home appliances, and building and industrial automation applications requiring 3V or 5V system control and low power consumption. New capacitive touch IP with improved sensitivity and robustness in the controller makes the devices suitable for challenging, non-traditional touch materials, or required to operate in wet or dirty environments, such as a kitchen, bath, or factory floor. The capacitive touch sensor also significantly improves noise immunity and sensitivity for operation in wet conditions or dirty conditions. This allows manufacturers to apply touch keys to a variety of challenging, non-traditional materials, such as wood, glass, or thick acrylic, opening up capacitive touch to a wider range of use in wet materials, while reducing safety or malfunction risks. The RX130 Group of MCUs combines excellent sensitivity and noise tolerance, making it possible to develop touch keys employing a variety of cover materials for use in a broad array of applications. These include control panels for electric appliances used in locations where they are likely to get wet, home equipment employing recessed switches for a more attractive design, and industrial machinery that must be operated wearing gloves for safety reasons. Multi-language support, integrated HMI and system control, and enhanced functional safety are among the key trends driving up demand for on-chip memory in the home appliance, and building and industrial automation markets. 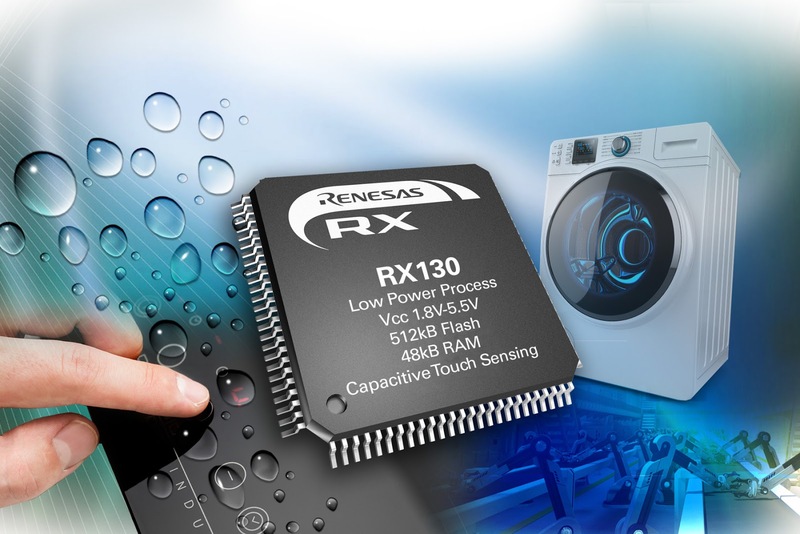 Renesas has expanded the on-chip memory range and package lineup for the RX130 Group. Designers can select an MCU with 64 KB flash memory in a 48-pin package, or 128 KB in an 80-pin package, and then move up to 128KB, 256 KB, 384 KB or 512 KB in a 100-pin package. With the wide lineup, designers can support evolving design needs using a single platform or common design as application code sizes and functionality continue to increase. Pin compatibility and software compatibility make it possible to reuse existing software resources and providing coverage for a range of low- and high-end devices. Hardware compatibility is supported by Renesas’ RX Firmware Integration Technology (FIT) Driver Package, which offers a common API that makes it easy for designers to move up or down seamlessly within the Renesas RX Family, and also reduces the burden of program development and software resource management in software development. The RX130 Group of MCUs is compliant with IEC/UL60730 safety standards for consumer electronics, with several built-in functional safety hardware elements. A Touch Solution Kit designed for a detailed capacitive touch evaluation and the Workbench6 v1.07.00.00 tool environment with improved noise immunity and tuning ability improve usability for capacitive touch software development.